Fall semester is soon coming to a close, and I’ve been thinking about traditions. They’re always important at UD, but it does seem as if the start of each new academic year brings them to the forefront. It’s been just a little more than three months since thousands of first-year students and their parents arrived for the annual Move-In Day tradition. A few days later, those same students took part in the Twilight Induction Ceremony, a relatively new ritual that’s already become a “traditional” experience. And then there’s Blue Hen football. As you see in the photo above, our students aren’t shy about showing their love for the Blue & Gold, a love that has endured for more than a century. Homecoming this year featured traditional reunions (and an unusually thrilling victory on the field). 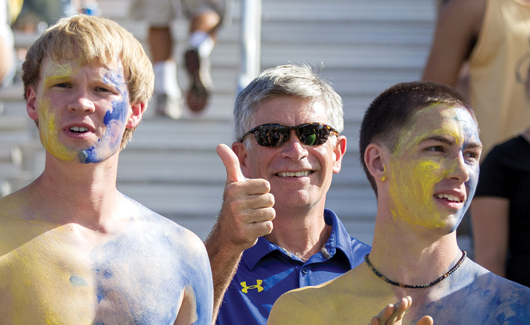 I hope you’ll enjoy reading about some of these traditions—and the many other notable events on campus and in our alumni community—in this UD Messenger.